We were very impressed with the Blackmagic Pocket Cinema Camera 4K, which is well worth considering if you're looking at the best 4K cameras for filmmaking. The latest firmware release addresses a couple of sticking points, particularly the battery life issue. A number of users have run into the problem where the camera would suddenly shut down, despite indicating a remaining battery life of 20% or even 30% – obviously a big drawback, if you're in the middle of filming something. Another commonly reported issue is that of dead pixels, which turn out not to be dead but rather 'stuck' to a single colour and in need of remapping. 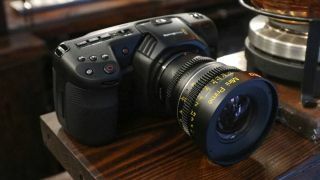 Thankfully the firmware update included in Blackmagic Camera Setup 6.1 address these and a number of other issues, including improved autofocus – particularly with the popular Panasonic Lumix 20mm f/1.7 lens. The Blackmagic URSA Broadcast can be had for "less than the cost of a DSLR"